As most of you know, we got engaged on October 6th 2017. We were in San Diego visiting for a trip and went to Point Loma to the Sunset Cliffs, which is where Eric Proposed. It was so special, romantic and beautiful, the best day of my life. We initially wanted to do a destination wedding to save money, but later realized getting married outside of the U.S. was just as expensive if not more than getting married here...with no control. We are trying to plan our wedding as inexpensive as possible but still our dream wedding. I've found a few little hacks along the way to help you guys out! One amazing purchase I made right off the bat was The Knots Wedding Planner Notebook! 1. Start thinking before getting engaged! It was a lot of fun looking at venues, but also really overwhelming because we never really left one feeing like it was "the one" until... The Vineyards at Chappel Lodge! I always said, a vineyard wedding would be cool because we love wine but didn't even know there was something like this so close to Austin! Also after looking at couple venues I loved the idea of getting married under a big oak tree and my heart was set on that! But.. it would have been awesome to just only look at venues like that from day one! However, we did learn a lot about what we liked and did and didn't want each time we saw a venue. 2. Don't plan anything until you decide on your venue! BUT FIRST: SET A BUDGET AND GUEST LIST! You need to set up your budget and guest list before venue searching! You should always try to stay at 50% of your budget with the venue and catering. So before even looking at a venue thats out of your budget, narrow down how much you can spend and how many people you will be inviting! *Ask if there are any hidden fees- if you need to put down a security deposit, pay for security, insurance etc. *Try to book a venue that you can hire all of your own vendors for! It saves money to hire outside catering and bring your own alcohol! 3. Book your photographer and plan an engagement session! Start looking for photographers AFTER choosing your venue! For me this was my number one vendor. Photos will last a lifetime! Wait to book your engagement session until you hire your photographer, because most photography packages come with an engagement session! It is also good practice to get to know your photographer! We are working with Honey Gem Creative, and Natalie Ebaugh Photography! -The cute boxes were from Michaels! I knew who my bridesmaids would be right away, so I started ordering random things on Etsy when we thought we were doing a destination wedding. I ordered some luggage tags, and sunglasses for the beach theme when we thought it was a destination wedding. (Which I later ended trying to return.) So, make sure you know your venue before asking! This way you can have your venues theme tie in with the bridesmaid proposal gifts! I ended up making these super cute gift boxes. I got mostly everything from Etsy and Michaels! 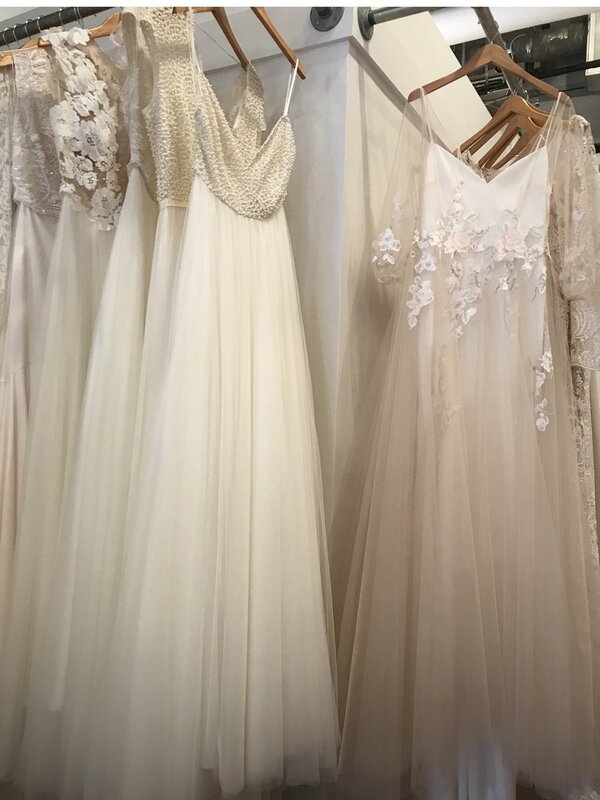 Once you have your venue, and bridesmaids picked, its time for dress shopping! A little tip for dress shopping: Try to wear jewelry, your hair how you envision it, and wear your makeup! That way you get a good idea of how you will look on your big day! I started with 2 places in Austin to check out. Serendipity Bridal and Melagne. Serendipity was AMAZING! I highly recommend this beautiful bridal boutique. I even ended up getting my dress for 15% off on Black Friday! WIN! Try to only set up 2-3 bridal appointments at a time. I scheduled appointments for these 2 places, 3 others later in the month and a couple in Chicago for late December. I ended up finding my dress and having to cancel all the others. Just take it one or two dress shops at a time! Chances are you will not need to look at too many places, it might get overwhelming. Overall yes, wedding planning has been stressful. BUT I've been having so much fun with it! Try to enjoy the planning process, it's probably the only time in your life you will be planning such a meaningful, exciting event.